James Maddison says Norwich head coach Daniel Farke is the reason behind his form this season, as his arrival gave him a "little kick up the backside". Maddison scored from the penalty spot to earn Norwich a 1-1 draw with high-flying Derby on Saturday. The 21-year-old is the Canaries' top scorer, with nine goals and five assists in 29 league games, and he is grateful to Farke for his guidance. "I always knew I'd take my chance when I got it," he told BBC Radio Norfolk. "I'm a confident lad and Daniel Farke coming in was the little kick up the backside that I needed. He gave me a chance to play at Fulham away (in August) and since then I haven't looked back." Maddison was signed by Norwich from Coventry in February 2016, but spent time on loan with the Sky Blues and Aberdeen before making his breakthrough this season. 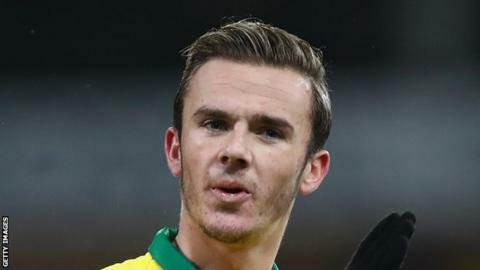 Former Borussia Dortmund reserves boss Farke was appointed Norwich head coach in May 2017, and although the Canaries sit 13th in the Championship after an up-and-down season, Maddison feels he has been important for his development. "Norwich is a brilliant platform for me. I'm playing every week, I've got a manager who likes the way I play, we've got a brilliant team and we're on the fringes of something really good," he said. "He [Farke] has been brilliant with me and he's tried to keep my feet on the ground, which I'm capable of doing myself but it's a manager's job to do that. "He's improved my game as well. The reason I'm in good form is not just down to myself, it's down to the manager and coaching staff improving my game."